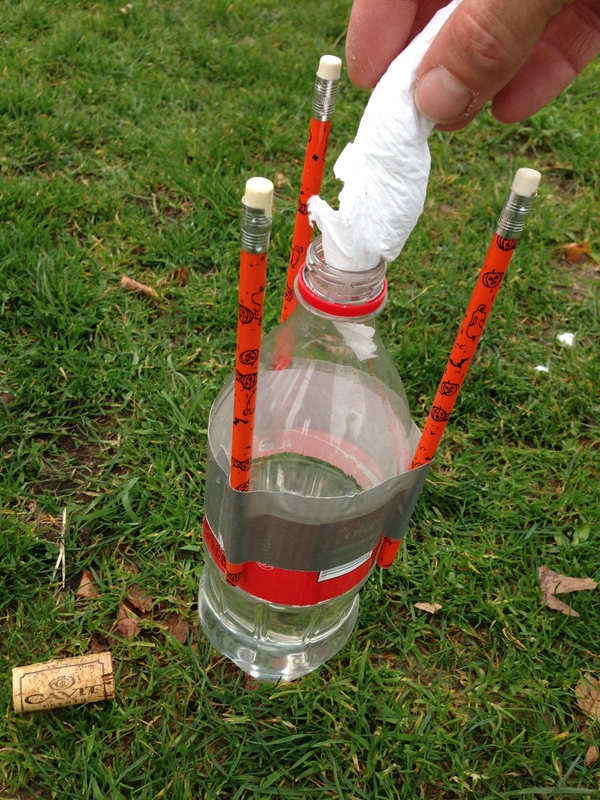 An adult sets off a rocket powered by the chemical reaction of baking soda and vinegar. Students figure out how the rocket works. What happens when we mix baking soda and something sour? It makes a gas. I will put baking soda in this part of the rocket, and vinegar (which is sour) in this part of the rocket. Then I will put them together. What will happen inside? Where will the gas go? Trapped. The pressure will build up, until it blows the top off. 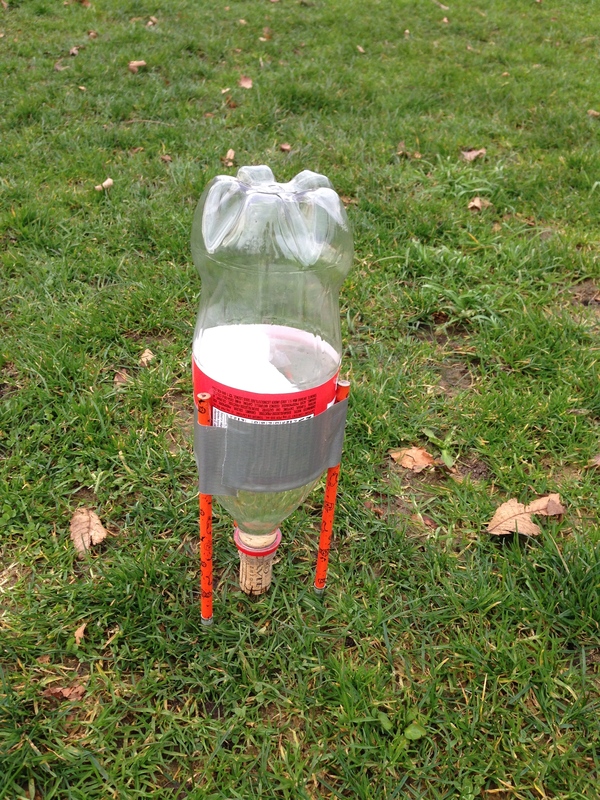 It is a rocket powered by a chemical reaction. I need you to stand back. And I will run back too once I have set it up. Important that you stand back. Give each student a model of HCO3 (baking soda) and H (the atom that makes vinegar acidic). We started with these in the rocket. The baking soda and vinegar molecules react and rearrange to make two new molecules. 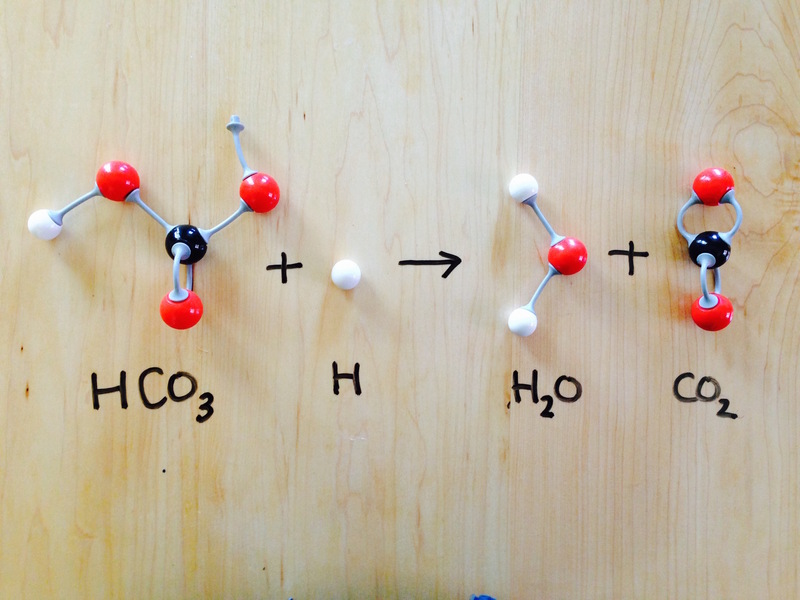 Ask students to figure out what these molecules are, giving them the hint that one of them is water. The products of the reaction are water (H2O) and carbon dioxide (CO2). Carbon dioxide is a gas, and as more and more of it is made by the chemical reaction, the gas builds up in pressure until it blows the cork out of the bottle. 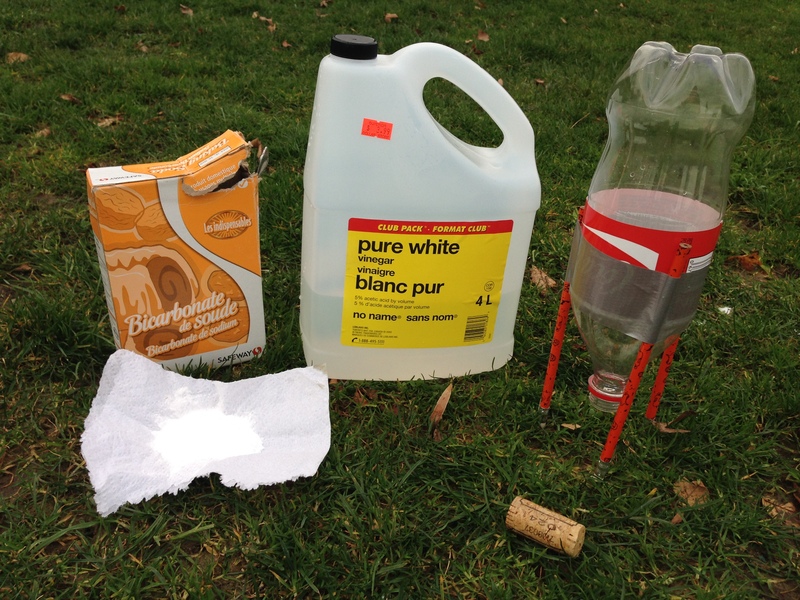 Once the cork is released, the gas can escape by shooting out of the bottom of the rocket. This force propels the rocket upwards. A rocket that goes to space acts on the same principal of action and reaction: the exhaust is expelled out of the back of the rocket, and this force is countered by a force on the rocket that propels it upwards. Get at least one set per student pair and several extra atoms of each type and 10 or so spare bonds. For 15 sets plus spares you'll spend about $100 with tax and shipping.